awwecarebear, you’re going to Pasadena! Amy, YOU’RE going to Pasadena! Leslie, you’re also going to Pasadena! So if your email is not included down there, shoot me a note at aprilhatesgluten@gmail.com and I’ll get your deets to the right people. Then you can come by, I can fill you in on all things gluten-free Ireland, you can score free samples from the amazing exhibitors, and oh yeah – guess what I just found in my closet? MORE OF THESE!!! Tags: celiac disease foundation, giveaway, gluten-free food. Bookmark the permalink. I sooooo want one of those buttons! They are awesome!!! Come by and meet me and get one! OMG I HAD NO CLUE there was an Allergy Expo in Pasadena this weekend!! DARN IT!!!!!!!! I LOVE THOSE THINGS because I am ALLERGY CENTRAL! Girl, come on by! It’s a dang good time. Maria, I’m pretty sure you can but I don’t want to guarantee since I’m not the person in charge!!! You can always send me a message on my Facebook if you get there and can’t get in and I can see about smuggling you in. 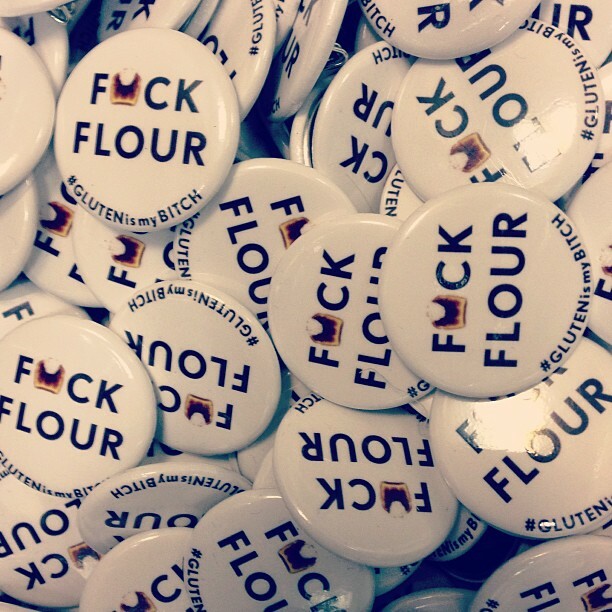 I want on of those F*uck Flour buttons. I can’t make it to Pasidena. How can I get one? Really!!! Thanks April. Looking forward to it. All the best for this participating in the event.